The annual summer picnic for the Society for the History of Astronomy this year was held in Liverpool, on Saturday 1st July 2017. 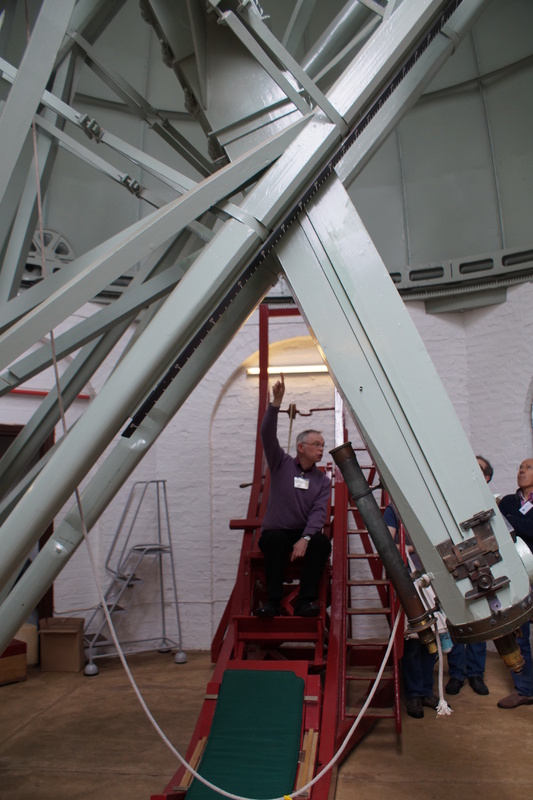 The picnic is an annual feature in the Society’s calendar and aims to combine an opportunity to socialise with other SHA members a chance to visit somewhere pertinent to the history of astronomy. This year the meeting was organised by the SHA’s Membership Secretary, Gerard Gilligan, who arranged for the picnic attendees to get a unique behind the scenes look at two of Liverpool’s iconic institutions, the newly rebuilt Central Library and its archives, and the internationally renowned World Museum. The day commenced in the museum’s planetarium which was opened especially for the SHA. 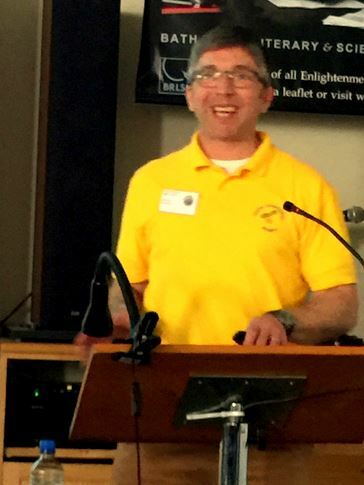 Patrick Kiernan, the planetarium’s educational demonstrator and SHA member, gave a fascinating talk on the history of globes and planetaria using the dome to project his slides onto. Following this, he played an educational video on astronomy so we all had an opportunity to observe the night sky and in all its glory above our heads; a really spectacular feeling. The party was then divided into two much smaller groups for unique tours behind the scenes of both the World Museum and the Central Library. 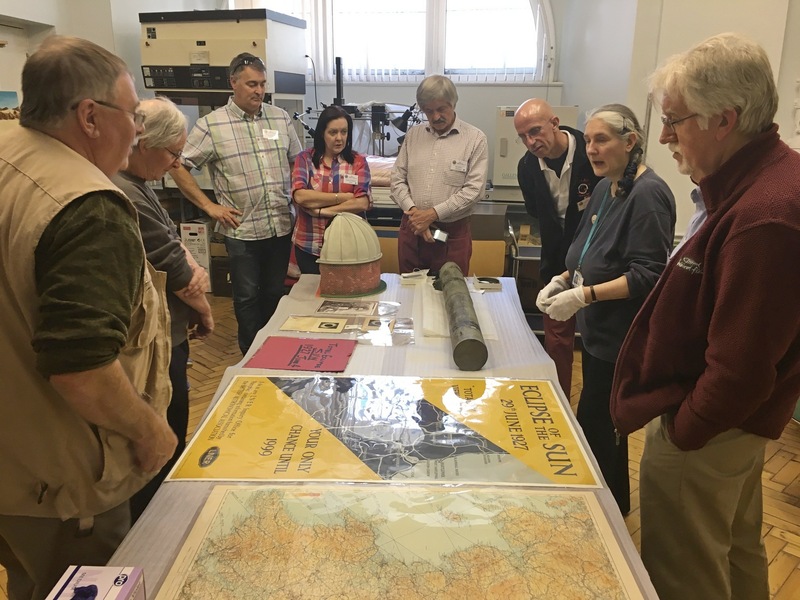 Wendy Simkiss, Assistant Curator of Earth and Physical Sciences, took us into the bowels of the museum, well away from public areas, and showed us various items she had prepared for us. Amongst these was a model of William Lassell’s observatory (the actual observatory was erected in 1840 and a report appears in the MNRAS), and the finder scope of his original 24″ speculum mirror telescope. The museum also had the 24″ mirror on loan and we had an opportunity to marvel at this. Wendy took us to see how other artefacts are stored and catalogued and talked to us about restoration and preservation of artefacts. The second behind the scenes tour was undertaken on the third floor of Liverpool’s Central Library, the neighbouring building to the museum. 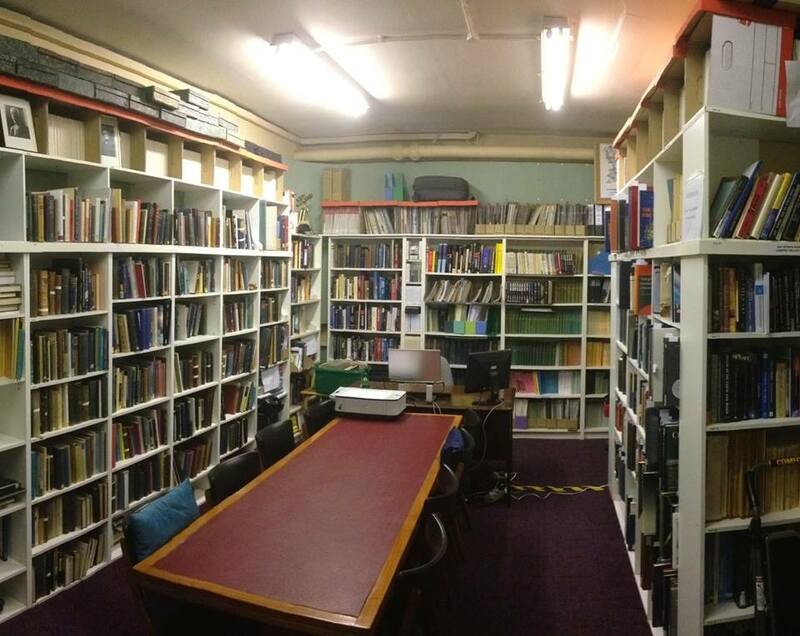 There we met Helena Smart, Senior Archivist for Liverpool City Council, who showed us the public areas where records and archives are accessed and described the types of materials within the library’s archives. Helena then took us into behind the scenes. The first stop was into the restoration and preservation laboratory; climate controlled, clinically clean with machines and devices to allow staff to rebuild torn pages, crumbling paper, and even to fumigate infested materials. Next, we went into one of the stores, with rows and rows of electronically moving shelves and a much cooler ambient temperature; Helena talked about how the types of materials being submitted to the archives are changing and not uncommonly hard drives are handed over which poses a myriad of issues for the archiving staff. 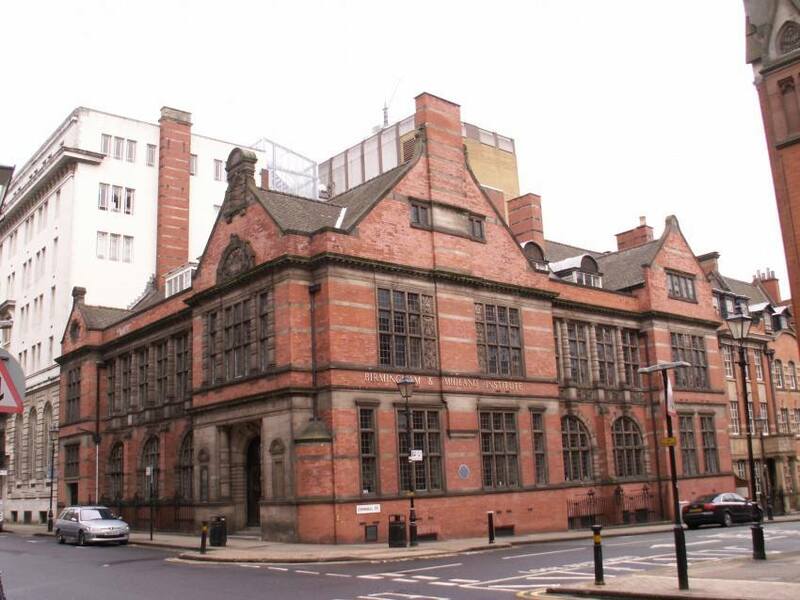 The next stop was back to the reading room where Helena had pulled out various astronomical treats from the archives relating to Liverpool Astronomical Society, and to the wider field of astronomy in general. The library tour finished with a look at the older parts of the building, and the circular Picton Reading Room, in particular, appealed to me, though the acoustics amplify even the slightest of sounds which shatter the otherwise silence amongst the readers. Liverpool isn’t a place I’ve explored before but this day out has whetted my appetite to go back. A wonderfully educational and inspiring day and great to catch up with old friends. This entry was posted in News on July 3, 2017 by societyforthehistoryofastronomy. A warm spring day greeted the attendees of the Society for the History of Astronomy annual spring conference at The Institute of Astronomy, Cambridge on the 22nd April 2017. Attendees were given a warm greeting by the SHA meetings organiser Dennis Osborne and members were presented with their new SHA lapel badge. After a brief welcoming talk by Bob Bower the societies Chairperson, the first talk of the day was given by Howard Carlton. Titled John Pringle Nichol, the Nebula Hypotheses, and Nineteenth Century Cosmogony. Howard explained how Nichol a Scottish professor of astronomy at Glasgow university was one of the first people to support the nebula hypothesis. He was an accomplished speaker and his enthusiasm for the theory was evident in the lectures he held as well as the books he wrote on the subject. This was a theory that was in its development and objections and alternate ideas were being fronted by people such as theologian Thomas Chalmers. Chalmers had argued that the universe was born fully formed. Critics also came in the form of observational evidence. This was particularly evident by the observations made from the Leviathan telescope at Birr castle in Ireland. This was the largest scope and it was hoped that observations here would give a definitive answer on the theories involved. Observations were and made and it was concluded that nebula could be resolved into individual stars. Robinson working with Lord Rosse declared that M1 could be resolved and that M42 was also resolvable. They invited Nichol to see the evidence for himself, which he did in 1845. The resolvability of the Orion nebula was a problem for the hypothesis, but Nichol refused to give up the nebula hypothesis and he gradually challenged the observations made. We thank Howard Carlton for a fascinating talk. The second talk was given by Dr James Hannam titled “Dancing to the Music of the Spheres: Medieval Visions of the Heavens. Hannam’s enthusiasm for this period was evident. He announced that he was to put right to rest the misconceptions that no astronomical advances were made during the medieval period in western Europe. The ideas being formed in that period were not just a rehashing of ideas from the ancient Greeks. Important advances included the design and manufacture of the Astrolabes, although these are difficult to date a number of these were made and the design perfected in this period. The escapement and mechanical clock were also invented in the thirteen century. Astronomical tables were calculated, these were used not only for the determination of the calendar, but also for use in astrology and medical fields. Hannam went on to discuss the position of astronomy within the curriculum at universities, the earliest examples being from Oxford, Bologna and Paris. This was a wonderful introductory look at the role astronomy played in the medieval period. If interested more information can be found within his book God’s Philosophers. 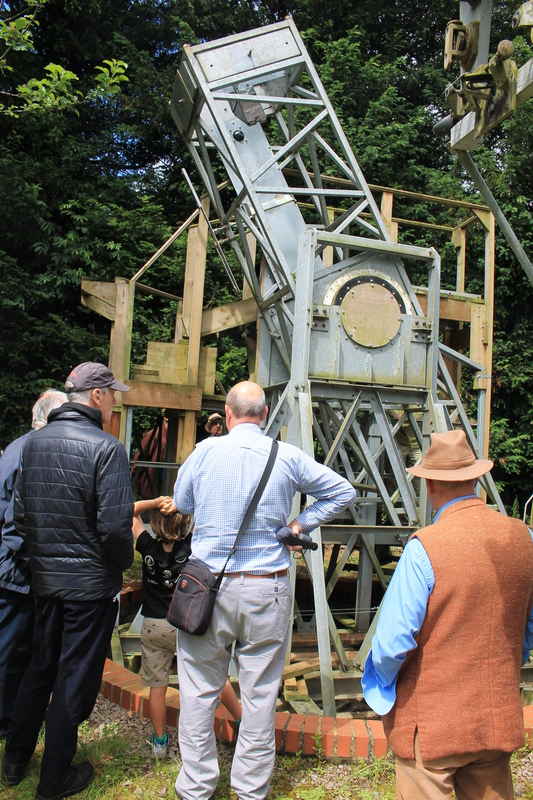 During the break for lunch, we were lucky enough to be given a guided tour by Mark Hurn the Institutes librarian of the grounds and the historic Northumberland and Thorrowgood telescopes. 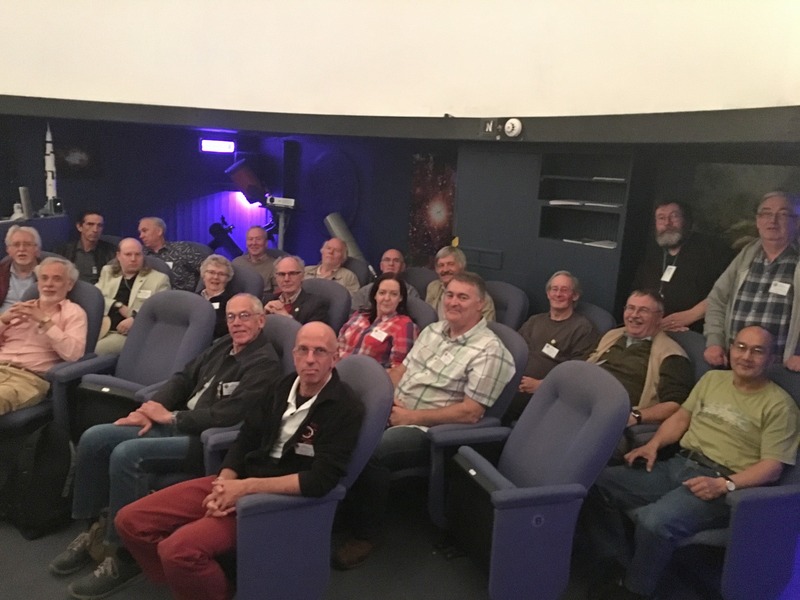 Mark took the time to regale us with stories from the history of the scopes including the infamous search for the planet Neptune through the Northumberland scope conducted by Challis in 1846. The lunch break held a well received raffle in which a number of books and prizes were on offer. The afternoon talks started with Dr Simon Mitton who spoke about the “History of Planetary Science – Discovering the Dynamic Planet Beneath our Feet”. This story was focused on the Earth, with many of the discoveries in this field made by geologists and Earth scientists. Simon’s fascinating talk took us on a journey of discovery with the important historic characters of this field. He spoke about the accomplishments of William Gilbert, Robert Hooke and Adam Sedgwick to name a few. It only being the latter of the 20th century that planetary science has seen significant developments. Many of the processed found on the earth are starting to be seen replicated throughout the solar system. Simon’s current research is within this field. Following this was Dr Stewart Moore well researched and highly topical look at the life and achievements of Charles Messier. Messier was never considered an academic astronomer, which makes his achievements all the more impressive. Born in Batonvillier on the 26th June 1730, his move to Paris came with the need to search for work. He originally worked as a clerk, but had been inspired at a young age by the impressive Comet de Chéseaux in 1744. He became an astronomer working at the Paris observatory of Joseph Nicolas Delisle. He discovered 43 of the items from the Messier catalogue, along with a number of comets during his lifetime. Particularly enjoyable were all the photographs that Stewart had taken in France showing us where Messier had been born and had lived during his working life. 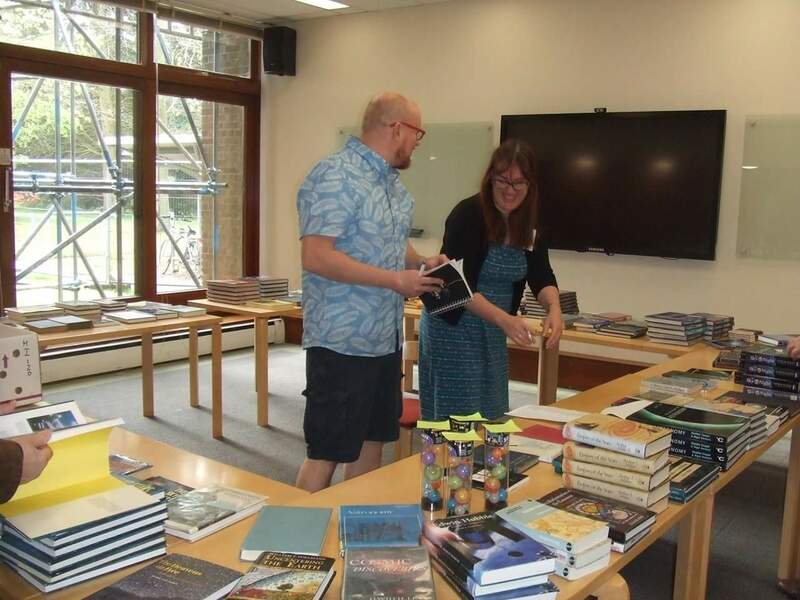 The afternoon break gave the attendees their final opportunity to look around the book sale that James Dawson the librarian had organised. There were a large number of books for sale, all from the field of astronomy, with many of them about the history of astronomy. This was a well received and great addition to the spring conference. The final talk of the day was by Mark Robinson, this was a talk which looked at the life of George Henry With, mirror maker. Marks depth of knowledge in the topic shone through, with the discussion of With’s life, his mirror making abilities and friendships made within the astronomical community all discussed. We were also fortunate that Mark brought along with him many diagrams of the processes involved and an example of a George Henry With mirror. The SHA would like to thank all the speakers for their informative and extremely enjoyable talks. It was lovely to catch up with lots of familiar faces and also to welcome 4 new members who signed up on the day. We look forward to seeing you all again at the summer picnic on the 1st July in Liverpool. Pictures Courtesy: Carolyn Kennett, Mark Hurn and Len Adam. This entry was posted in News on April 26, 2017 by societyforthehistoryofastronomy. 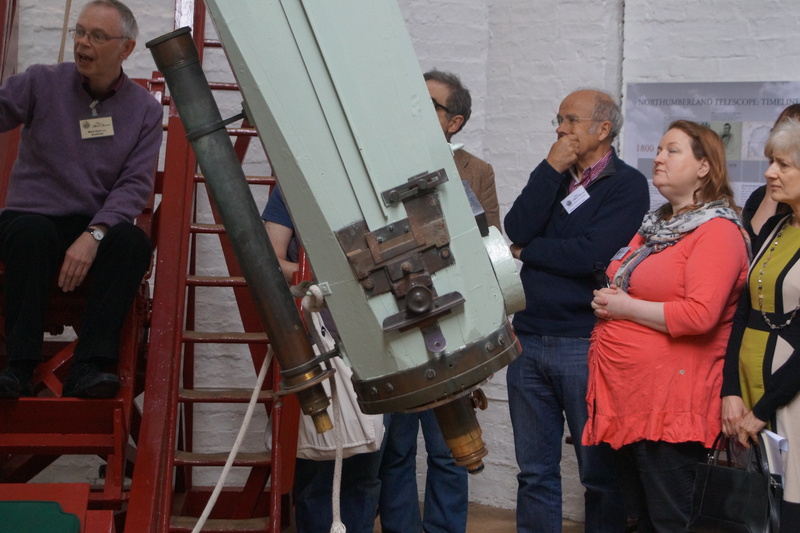 The SHA will be at the International Astronomy Show this weekend at Stonleigh Park in the Midlands near Leamington. See http://www.ukastros how.com/ for further details of the main event. We will be on Stand 27. Come and learn more about the fascinating History of Astronomy, by doing several fun things to do. Perhaps you may even join us. This entry was posted in News on October 12, 2016 by societyforthehistoryofastronomy. This entry was posted in News on August 27, 2016 by societyforthehistoryofastronomy. The 3rd Earl is credited with the discovery of the spiral nature of galaxies by observing and drawing the Whirlpool Galaxy (M51), amongst others, using the giant 72 inch diameter reflector he had built in the grounds of Birr Castle, his ancestral home. Construction began in 1842 of the ‘Leviathan of Parsonstown’, as it came to be called. It was completed in 1845. For 70 years it was the largest telescope in the world. This entry was posted in News on June 17, 2016 by societyforthehistoryofastronomy. 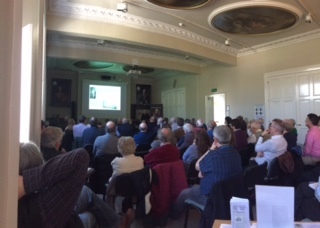 The 2016 Spring Conference was held on Saturday 2nd April at the Royal Literary and Scientific Institute in Bath. 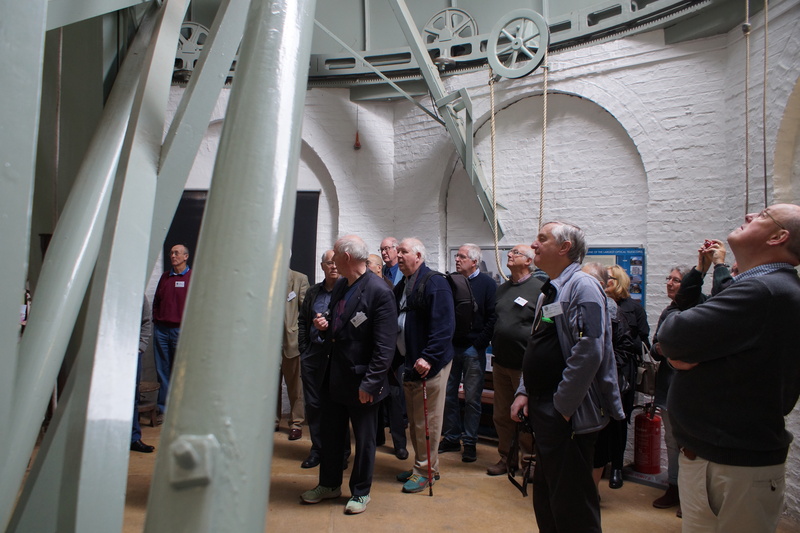 It was a joint meeting between the William Herschel Society and the Society for the History of Astronomy. 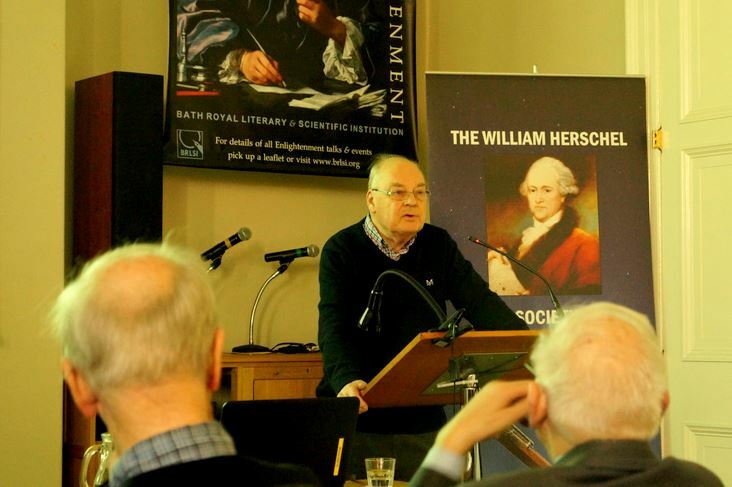 This was the second joint meeting we have held with the William Herschel Society and Chairman Bob Bower expressed how privileged we were to make a return to Bath, the city which William Hersch el made his home. The surroundings were magnificent especially since it was a beautifully warm spring day. The conference was extremely well attended by both societies, with over 35 members of the SHA and about 75 people in total attending. These included a number of guests which were warmly welcomed by both chairmen, Roger Moses from the WHS and Bob Bower from the SHA. Initial introductions for the talks were made by the respective chairmen. Three of the five talks had a local theme in keeping with Bath and its surrounding area. The morning’s event had three talks scheduled, with two talks to follow in the afternoon. 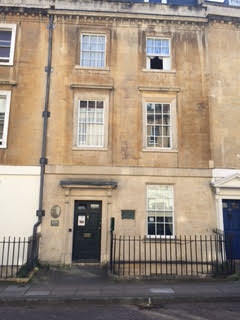 Finally, there was a reception at the William Herschel museum located a few streets away in Bath. 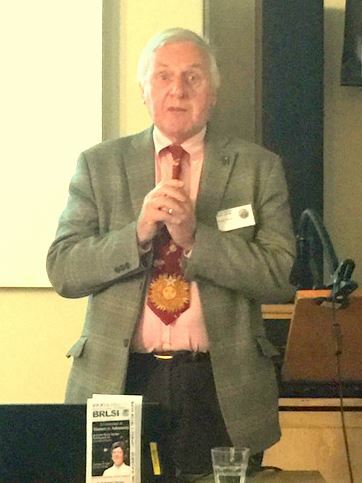 The final talk during the morning session was from Dr Roger Moses, the William Herschel’s Society’s president. His wonderful talk was one of recent struggles to understand more about cosmic rays. The talk was titled ‘A thin hard rain from outer space: 100 years of cosmic ray astronomy’. Roger explained about the initial discovery of radioactivity by Henri Becquerel in 1896 and how this lead to experiments by Father Theodor Wulf who developed the gold leaf electroscope. By 1912 Victor Hess took one of Wulf’s electroscopes onboard a hot air balloon. These balloon trips could last hours and would reach nearly 6 kilometres and all of this was undertaken in a tweed suit and professors hat! These experiments lead to many questions about radioactivity within Earth’s atmosphere. Roger went on to explain how in 1933 Carl Anderson discovered the first antiparticle the positron using a cloud chamber. It would take another thirty years for scientists to reach a greater understanding of the processes these particles go through. Work at higher altitudes within the 1970’s became very expensive and there was no guarantee of success and sometimes the high altitude balloons were lost. This cost was negated by putting the experiments into the satellite Ariel 6, launched in 1979, with experiment HEAO C onboard. Roger moved on to discuss the current understanding of cosmic rays. He then explained that on contact with the magnetic field they create the auroral lights. Interestingly it only takes one particle to boil a cup of coffee! We were finally shown some amazing photographs of active galaxies from which these particles originate from such as M87. This talk gave a fascinating insight the recent understanding of cosmic rays and we thank Roger for sharing his expertise in this subject. 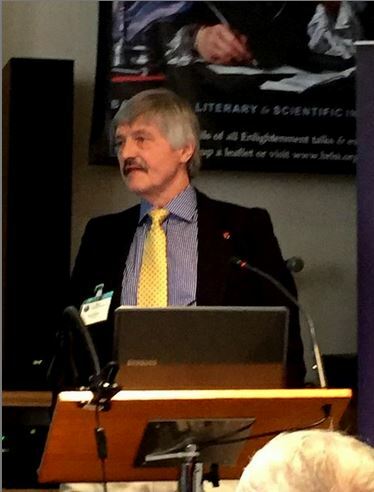 After lunch Professor Francis Ring, a founding member of the William Herschel Society, its current vice Chairman, editor of WHS publication The Speculum spoke about William Herschel and his links with The Bath Philosophical Society. 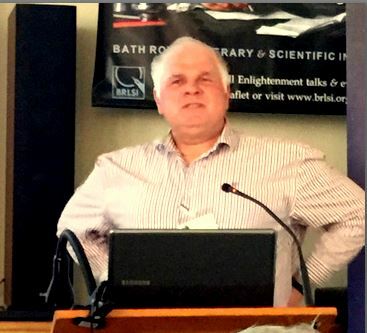 It was especially gratifying to have a talk about William Herschel within historic Bath. We thank Francis for giving this fascinating insight into Bath at the time of William Herschel’s residence in the city. Francis explained how Bath was a crucial melting pot for science and culture in the 18th century. There was a large amount of buildings being built and it was forming into an elegant city. Herschel had arrived in Bath as the organist for one of these new buildings the Octagon Chapel. As well as this Bath had a large number of coffeehouses and tea rooms in which educated people would meet. Francis explained this encouraged an enlightenment of ideas to occur Bath, where science could be discussed freely. In Bath 250 year ago a philosophical group formed out of the Agricultural Society. Twenty-seven people were invited to form this new society, which would meet twice weekly. The founding members included famous names such as Joseph Priestley, William Smith, John Bryant, Benjamin Smith, William Falconer and William Oliver. 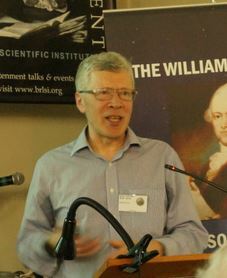 Two other members which were crucial to Professor Ring’s talk were William Watson and William Herschel. Francis explained how William Watson had met William Herschel in River Street in Bath. Herschel had been observing through his 7ft telescope in the street outside his house. From this they would form a friendship which would be very fortuitous to Herschel. 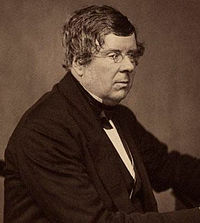 Francis argued it would be the well-connected Watson who would be responsible for Herschel rapid rise in fortunes. Unfortunately, The Bath Philosophical Society collapsed at as similar time to the departure of William Herschel from Bath. We thank Francis for his fascinating contribution to the day’s talks. 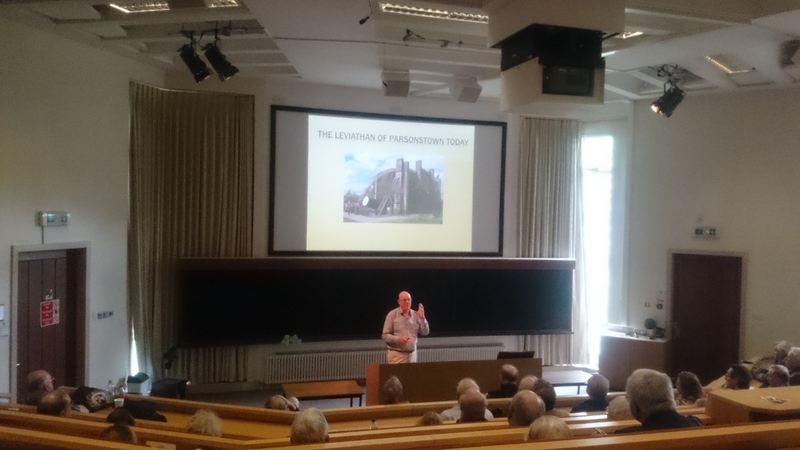 Introduced by Bob Bower, the final talk of the day was by David Love about his research into the life of Johannes Kepler. David Love has recently had his expertly researched book on Johannes Kepler published by Prometheus Press. He gave an infectious talk on Kepler who was one of his heroes. The talk started by looking at Kepler’s early life, how he had been educated in the Greek teachings of Plato and Aristotle, with the Earth at the centre of solar system. David explained that Kepler had been introduced to Coperincism at university and he liked the idea of the heliocentric solar system, although many did not. David moved on to his time in Graz Austria where he was a maths teacher. It was here in Graz that Kepler came to his first two theories. David explained how Kepler had to flee Graz in 1600 due to religious persecution. This would actually become a common theme in his life. He worked briefly under Tycho Brahe, until Tycho’s death in 1601. He was then able to take on Tycho’s position as imperial mathematician to the Holy Roman Emperor. It was here that he found his first two laws of planetary motion. Up to now David explained previous theories had all used circles so Kepler’s use of an ellipse was a massive leap forward in understanding. Kepler was now using maths to accurately predict the motion of the planets. These laws took 5 years to reach and were published in the 1609 book Astronomica Nova. Once again Kepler would have to move, this time to Linz, where he would spend the next 15 years. David explained that it was in Linz that he would devise his third law of planetary motion. Kepler died in 1630, unfortunately there is no grave as this was destroyed in the 30-year war. David explained that Kepler’s greatest legacy was that he used mathematical concepts to accurately predict the location and motion of objects in the night sky. David Love’s book is called Kepler and the Universe: How one man revolutionized astronomy. Th ere were a large number of questions from the audience of which David and Allan Chapman were generous enough to give full and clear answers to. This part of the conference ended with the chairman thanking all five speakers for their enjoyable contributions to the day’s events. Also thanked were Mike Leggett and his wife Pat who had worked tirelessly to get this event off the ground and for their work on the day welcoming members and guests alike. The meeting was closed and excited delegates were invited to make a short trip to the local Herschel Museum. The museum is located at 19 New King Street in Bath and was the lo cation of the discovery of Uranus by William Herschel on the 13th March 1781. The museum houses three floors of exhibitions relating to William and Caroline Herschel. Particularly fascinating is the workroom. 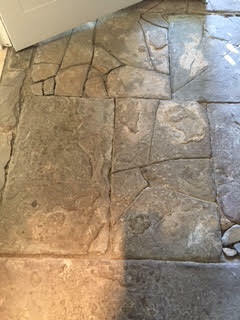 It contained a number of objects including the smelting oven and the famous cracked flagstone floor. On hand during our visit were a number of museum staff who were happy to answer any questions we had about the Herschel’s. The visit to the museum and the reception that followed was a perfect way in which to complete a fascinating day in Bath. This entry was posted in News on April 10, 2016 by societyforthehistoryofastronomy.